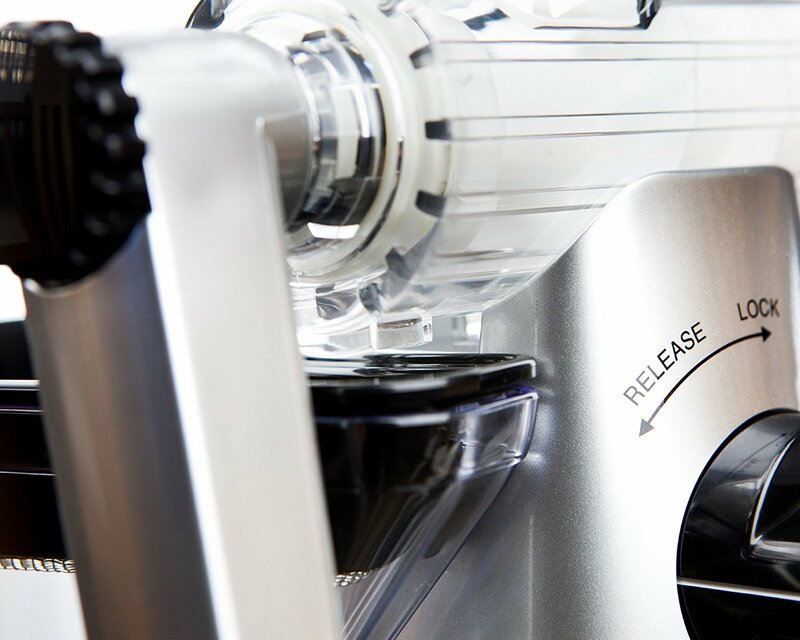 GUARANTEED HAPPY JUICING: The Manual Healthy Juicer has a guarantee. Its simple. If you arent happy, send it back. We are confident in our product and maybe that is why for over 10 years our customers have kept us going and growing! 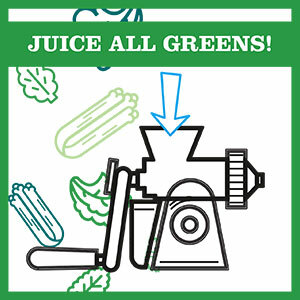 MULTIPURPOSE JUICING: Juices Wheatgrass, Kale, Spinach, Collard Greens, Chard, Parsley, Lettuce – anything leafy – EASILY! Does it juice carrots and such? Yup, it sure does, but if thats your primary reason for juicing wed probably encourage something else. Everything else, the Healthy Juicer is KING. DESIGNED FOR EASY CLEANING AND EASE OF USE: We realized early on in development that ease of clean and effectiveness were the two most important things. Why? Because we made this because we were frustrated with the other options! Give the Healthy Juicer a week of use and you will get to our promised 30-Second Cleanup mark! It just takes some getting used to, but we promise its true. If its not, send it back. Includes both a Suction Base AND Table Clamp! Use anywhere and its GREAT for travelling, camping or in the RV. Easy to store under the shelf as well but fun enough to leave on display. DEVELOPED BY PEOPLE WHO JUICE: We developed the Healthy Juicer because we were tired of the super expensive electric juicers and cheap-o manual juicers out there! After trying one of those, 10 years ago, we set out to make a high quality unit that ACTUALLY WORKS and doesn’t break! In consultation with an industrial engineer we brought to market the highest quality and best manual juicer on the planet. Guaranteed. 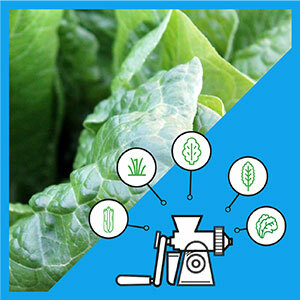 Why Juice Your Greens with the HEALTHY JUICER? Because juicing a glass of your favorite greens shouldn’t take up your whole morning. 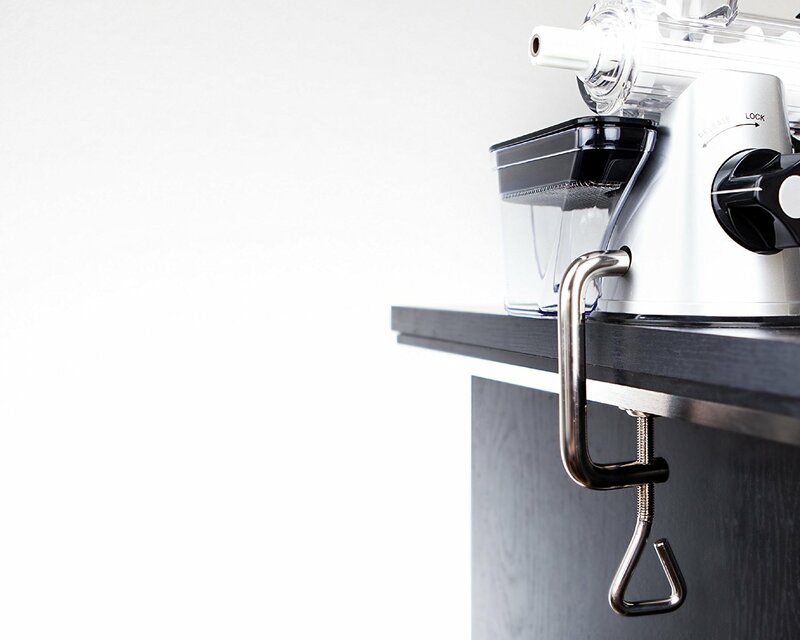 The Healthy Juicer was designed to be simple, mobile, versatile, and EASY TO CLEAN. Don’t waste 30 minutes of your day when you could spend 5 minutes or less to get a large cup of green juice! 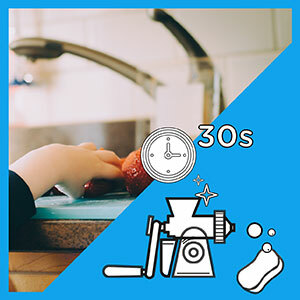 People choose the Healthy Juicer because it saves them time and is easy to clean – 30 seconds or LESS. Prep your greens, place the juice cup under the spout by the handle, and you’re on your way. Now what? 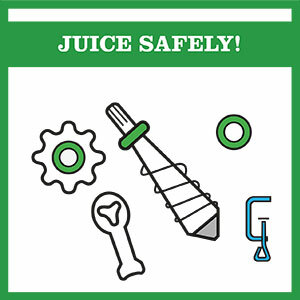 After you’re done juicing, unscrew the parts, rinse them off in the sink, and walah! You’re done. NO screen to spend 20 minutes scrubbing. Drink your green juice and get back to enjoying what you love. Have you ever juiced before and felt like you weren’t getting much juice out of all the greens you put in? We had the same problem, which is why we designed the Healthy Juicer! It’s high juice yield and cold-press technology will ensure that you’re getting the MOST out of your greens. 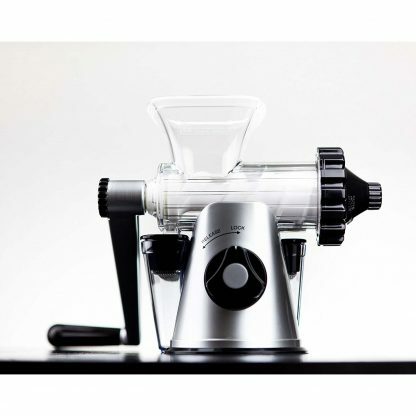 Get more juice, faster with the Healthy Juicer! This recipe is heavy on the greens and is packed with nutrients. The Granny Smith apples add a delightful kick! 10,000+ PEOPLE LOVE THE HEALTHY JUICER? WHY? IT’S VERSATILE, EFFECTIVE, & SAFE! Be as Creative as You’d Like! Juice all your favorite leafy greens and wheatgrass! 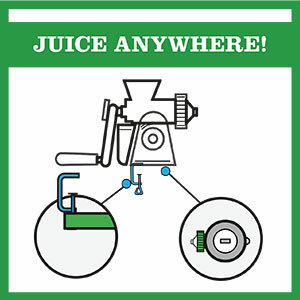 The Healthy Juicer ensures that you get the MOST out of every green you’re juicing. Get creative. Have fun with it – Try a variety of greens and start your day with a nutrient boost. Juice in Your Kitchen or On-the-Go! The Healthy Juicer has both a secure-locking suction base and a table clamp, should you need it. Juice with confidence. After you’re done juicing, break it down into its 5 main parts and store it the cabinet or pack it up for your weekend trip. BPA-Free Auger with Stainless Steel Tip and Stainless Steel End Cap. Impressive! I was apprehensive at first reading a few disappointing reviews for this juicer, but decided to give it a go. It exceeded my expectations by a wide margin. If I've paid twice as much for it, I would still call it a good purchase. Now, having used it for almost a month, I can understand why some people struggle with it. People report juice coming out of both ends or very little yield. The problem is most likely with how feverishly you spin that lever and how you feed the wheatgrass. What I found works best is to twist blades of grass into a thicker rope and feed it. Twist the lever slowly and methodically and that will minimize the overflow on the other end. That being said, you will still get a drop or two spilled before a "plug" forms at the end. After a few feeds reverse a rotation of the lever and back everything to the rear end. Yes, you get foam coming out, but also a lot of juice with it (up to 20%). A 6" X 10-12" plot of 10" high wheatgrass gets me roughly a shot glass of juice and what comes out is pretty dry. 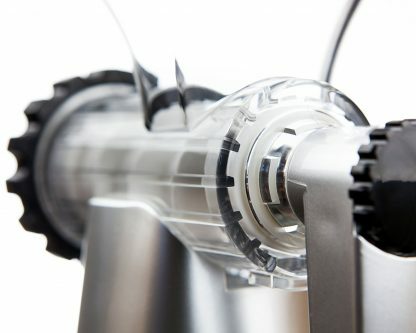 The best way to hold it while juicing is to put your left hand on top of the barrel and use a thumb to keep juice cup close to the juicer while rotating a lever with your right hand. 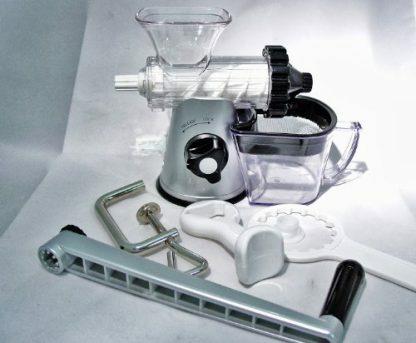 Juicer is easily washable and well thought out. I haven't used it on anything but wheatgrass so far, so I can't comment on its ability to juice other things. great value! I decided to order my Lexen Healthy Juicer after one of my favorite juicing bloggers talked about how much she enjoyed it and I checked out some positive reviews. I've had it for a week and have really, really enjoyed using it. 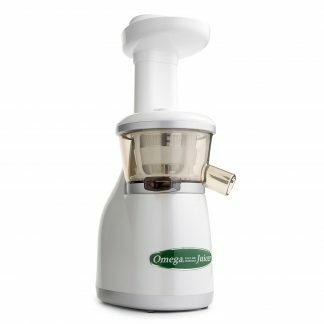 It's my first ever juicer and perfect for someone who juices daily but doesn't want to lug out a big machine. I'm moving into an apartment later this year and imagine I'll be happy to have something that takes up so little space too. 1. Don't believe anything anyone has said about this juicer being difficult to operate. It's all manual power, so don't expect a motor, plug or batteries. 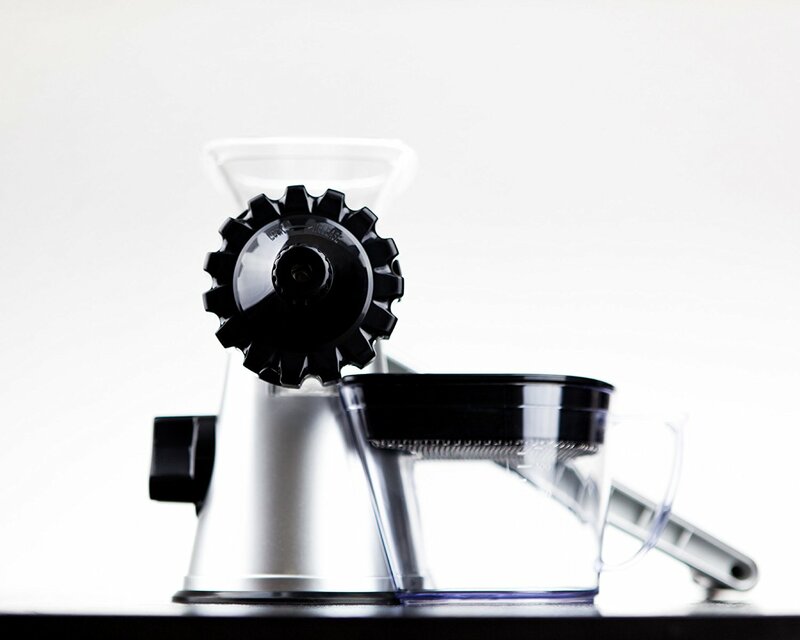 You simply turn the handle, it grinds/chews up whatever you've fed in and spits out the dry matter on the end. If you're juicing harder items, like carrots or chunks of ginger, cut them into manageable pieces and make sure you're using the enclosed clamp the keep your juicer in place on the edge of your table or counter. And be patient -- don't put whole handfuls of carrot pieces into it at a time. 2. I've heard this said for anyone juicing - manual or electric - but it bears repeating: Prep your ingredients beforehand. That includes washing everything thoroughly, especially if you won't be removing the peel. Place it all in a bowl and keep it nearby. I find that by doing that, I can get into a nice rhythm where I'm feeding in fruits/veggies, giving the handle a few cranks and then ready to feed in more. 3. It pays to make sure all the parts are properly tightened before you start. The green part at the end and the small, beige end cap need to be tight to make sure that your precious juice doesn't leak out before it flows to the back and drips into the tray. 4. When the screen on top of my tray gets full of foam/pulp, the juice has a hard time dripping through. I keep a spoon nearby and move things around when I notice there's a backup. If necessary, I'll scoop some of the gunk out and put it into the bowl that's already catching the solids coming out the other end. 5. Clean as soon as you're done. If you do this RIGHT AWAY, clean up is incredibly easy. No scrubbing necessary. Rinse with water, wipe with a sponge or paper towels and lay it out to air dry. A note on yield/time commitment: From start to finish, I can now make enough juice to fill two 500 ml jars in 30 minutes. That includes prepping ingredients, assembling the juicer and rinsing it out between juices since I make two different kinds each day. Gets the job done! this works fine if youre just using it everyday for you and your husband. Assembly is easy and cleaning is pretty str8 forward and simple. It could get a bit messy until you figure out what to do first. i would put a plate where the squeezed out leaf would come out to avoid any mess since a few drops of the juice do come out along with it from time to time. The container holding the wheatgrass juice is placed on the side and it works fine the way it is. Well i do like it, i find it simple. no need for no fancy gadget to get ur daily shots of wheatgrass. 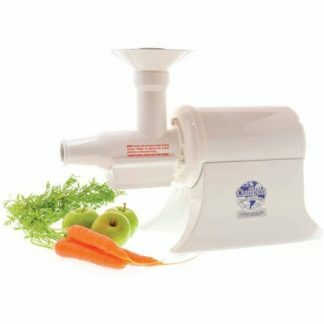 Ecomonical on Produce and a Great Travel Buddy I bought this juicer to use in my travel trailer. My Electric centrifugal juicer broke down the other day so I pulled this one out till the new one comes. I juice everyday and this one obviously takes more time then the electric one but it worked great. It juiced every vegetable I put in it and some of them I didn't even bother to cut up. The pulp was fine, no chucks. You can throw it back in if you want it dryer. Definitely getting your moneys worth by not wasting produce. Easy to use, you don't need to be strong to turn the handle. Easy to clean, I just rinsed it off by hand. Very sturdy for something made of plastic, I was impressed. Later that day I used it for my wheat grass which I can't juice in my centrifugal juicer. The strainer screen seems to need to be dumped often but it's not really a problem. There are several parts to this juicer but if you clean it right after use they should be easy to keep track of. I can't say I will use this one everyday at home after the new juicer comes because of time. But for travel this will be great, very light weight, small size, versatile, economical with the cost of produce, no noise, no electricity necessary and you can just rinse it off in any hotel sink. If you can't afford a expensive juicer I wouldn't worry about it because this one juices everything. 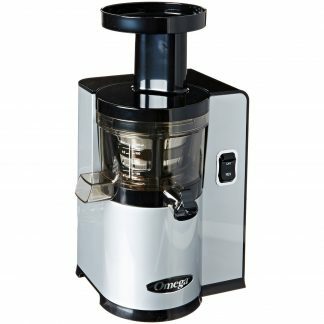 Also it won't heat up your juice with this auger style of grinding, it works just as good as any expensive juicer but the price is way better.